P.I.D. temperature control technology ensures preset temperature to be reached rapidly without any fluctuation. Wide range control of temperature, pressure and time could meet various test conditions. Manual or pedal switch control, as well as anti-scald design provides convenient and safe operating environment. 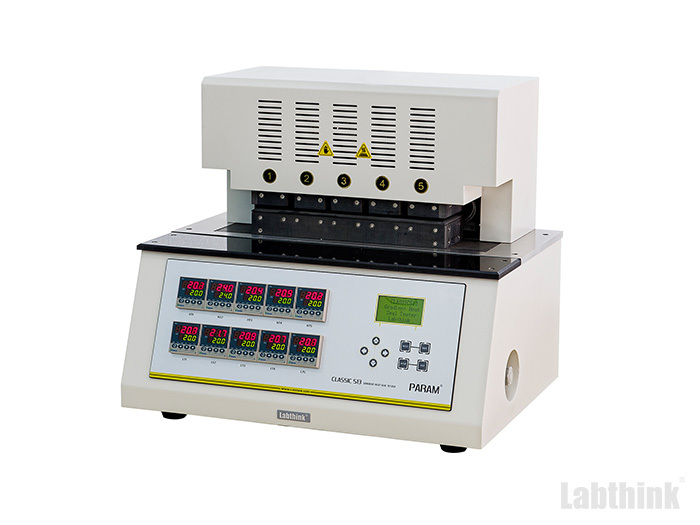 The instrument is controlled by micro-computer with LCD, PVC operation panel, and menu-interface, which is convenient for customers. 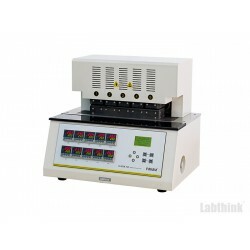 The instrument could test 5 groups of 2 specimens at different temperatures simultaneously, and accurately and efficiently obtain heatsealability parameters of the tested specimens. 5 upper sealing jaws are individually controlled by 5 gas cylinders which ensure the stability of heat sealing process. The heating tube joints can be easily installed or removed for rapid replacement. Independent temperature control of upper and lower sealing jaws allows multiple combinations of test conditions. Equipped with micro-printer for convenient data saving, exporting and printing. Note1: There are five upper sealing jaws and five lower sealing jaws for heat seal test. The temperature of all the sealing jaws can be controlled independently. All of the sealing jaws are heated sealing jaws. The unheated sealing jaws can be selected as lower sealing jaws.